We shoot it! We print it! 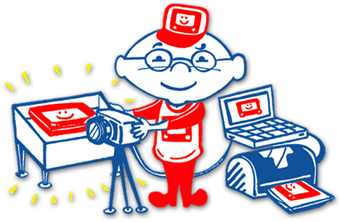 After the Etch Man completes your Etch portrait, we professionally photograph it, then print the photo on keepsake cards custom designed to reflect the theme, logo, or color scheme of your party. PHOTO U can be added to the PRESERVE U EVENT party OR booked on its own as the PHOTO U CLASS PORTRAIT. One Group! One Etch A Sketch! Multiple Prints! 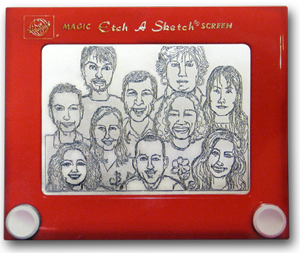 The Etch Man will sketch up to 30 guests on a traditional Full-Size Etch A Sketch (1-4 units per party) or approximately 10 guests on a 5.5 x 6 inch Travel Size Etch A Sketch (2-6 units per party). Guests take home a digital print of their group sketch while the host gets to keep the preserved Full-Size Etch A Sketches. Recommended for larger parties, class or family reunions! Note: Guests will be sketched one at a time, and do not have to pose as a group.